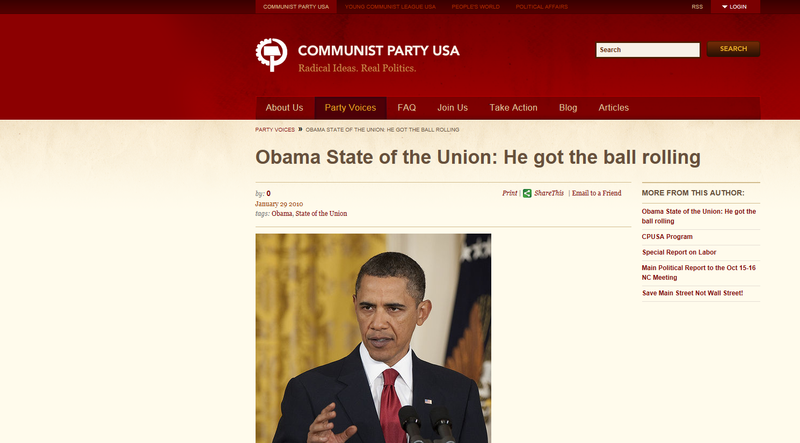 “Obama got the ball rolling,” the communists joyfully told us. Mind you, it turned out to be a WRECKING BALL. This becomes another opportunity to point out the same thing I’ve pointed out before. When Karl Marx stated the central thesis of communism, “From each according to his ability, to each according to his means,” I pointed out that he would make a hell of a great Democrat today. I’m posting the article just to point out THAT THIS SAME ARTICLE COULD HAVE BEEN WRITTEN BY A DEMOCRAT OR A MAINSTREAM MEDIA ‘JOURNALIST’. Only it was written by the same exact thing going by a different label: a communist. In some ways last night’s State of the Union address by President Obama was a virtuoso performance. There were stirring moments, memorable turns of phrase, humor, a defense of activist government, and proposals that will be welcomed, and surely help, millions of people in need. With the scent of Massachusetts still in the air, the president reasserted his reform agenda and took the fight to the party of obstruction. In polite, nuanced but forceful terms, he chastised the Republican Party. In powerful oratory, he challenged some of the main ideological talking points of right-wing extremism, reminded everyone that he inherited record deficits and an unprecedented economic mess, and defended the stimulus bill and other recovery measures, including, and unfortunately the unconditional bank bailouts. One of the high points of the evening was when the president called out the right-wing (and maybe worse) dominated Supreme Court whose members were sitting directly in front of him for their recent decision saying it’s OK for corporations to throw money into the election process. They had hoped to hear President Obama repeat what President Clinton said in his State of the Union address in 1994: “The era of big government is over.” But the president disappointed them. While the broad people’s coalition that elected him will not, I’m sure, be entirely happy with the president’s speech, all signs are that his fighting tone (“I will not quit”), his focus on the economy, his defense of democratic rights (civil, labor, women, immigrant, gay and lesbian), his insistence on financial reform, and his policy initiatives outlined in the speech, including a health care bill, will reenergize this coalition, which, as of late, has been understandably dismayed by the pace and depth of change. But this new energy will quickly dissipate if the White House and congressional Democrats go back to ignoring the rumbling from below and bending over backwards to satisfy Republicans and conservatives in their own party. Working people expect them to draw a line in the sand, show more partisanship, push the legislative process, and tenaciously fight for the American people. If the Republicans obstruct and filibuster so be it. At least everybody will know who is blocking legislative measures that would ease the economic crisis when they go to the polls this fall. But as good as many parts of Obama’s speech were, it didn’t fully rise in substantive terms to the challenges of our times and this era. The president could have knocked the ball out of the ballpark, but he settled for less. He had a chance to make the case for deep-going political, economic and social reform, including radical reform, but he came up short of that. His speech didn’t have the programmatic depth that is objectively necessary at this moment. It took us an important step closer to solving the awful economic mess and relieving the human toll that comes with it, but only a step. Politics is an art as well as a science. And part of that art includes knowing when to advance and when to retreat. Last night President Obama didn’t retreat, but he didn’t advance the people’s agenda to the degree that was possible and necessary. He roused the nation, but he didn’t hit the high note. We would probably have to go back to Franklin Roosevelt to find a president who has the trust of our nation’s multi-racial, multi-national, male-female, young and old working class as President Obama does. But the people’s trust has to be constantly renewed – and on the basis of practical performance, on the basis of systematically fighting for the crying needs of the American people. This president can be a transformative leader (he has that potential in my view), but only if he embraces and fights for a transformative agenda. That agenda in a full-blown sense has yet to be articulated by him. If President Obama and the Democrats want to hail the private sector as the engine of growth, I wouldn’t quibble too much as long as they recognize that the private sector at this moment (big or small business) isn’t generating jobs and probably won’t for a long time. In these circumstances, only direct and indirect government intervention in the form of a massive public works jobs program, infrastructure repair and renewal, aid for state and local governments, and special measures for the hardest hit communities, and especially communities of racial minorities and immigrants, stands a chance of lowering unemployment in any kind of meaningful way. In other words, the economy still has to be re-inflated and restructured along democratic, sustainable, nonmilitary, and worker-friendly lines, but the likelihood of the private sector doing that is zero. To a degree, the president is moving in this direction, but the pace and nature of the economic reforms that he prescribes is far too limited for the scope and depth of this crisis. One of the serious missteps that he made last night was his call for a freeze on domestic discretionary spending, beginning in 2011. Hopefully the freeze is only a political calculation to ward off the Republican wolves who accuse him of being a “spend and tax” liberal. But in any case, it comes with a price insofar as it entrenches in the public mind that deficit spending is inherently bad and that our budgetary woes are caused by “handouts” to the poor and vulnerable, especially people of color and immigrants – not to mention aid to developing countries. This is an unmitigated falsehood that ruptures our sense of social solidarity, of connectedness to every other human being. The truth of the matter is that the current budget deficit, as the president said, began during the Bush years as a result of two wars of aggression, mammoth tax breaks to the top income tier, and a bulging military budget. Fiscal discipline and balanced budgeting are not an article of faith that has to be adhered to no matter what the circumstances. If that were the case, the U.S. and world economy could easily have tumbled into a full-blown depression last year. Capitalism isn’t a self-correcting system. Market failure and crisis are as much a reality as sustained economic growth. Vicious and reinforcing contractions of the economy can easily leave an economy stagnating at a far from optimum level or in complete ruin unless they are counteracted by aggressive government action and spending measures. The stimulus and anti-crisis measures of the Obama administration acted as a tourniquet; it stopped the hemorrhaging. But it didn’t heal the wound. If the president looks to the Depression years he will see more than one Roosevelt. There was the Roosevelt of 1934-1936 and the Roosevelt of 1937. The 1934-1936 Roosevelt had hit a wall as far as his reform efforts were concerned and he was faced with a moment of decision as to how to proceed – should he stay the course, retreat, or enlarge his vision. He chose the latter and thus the New Deal. Or Obama could look to the 1937 incarnation of Roosevelt who, when seeing a surge of economic activity, decided to cut back on spending and balance the budget, which, as it turned out, was exactly the wrong medicine for an economy in its early stages of recovery. From President Obama’s speech it seems like he hasn’t definitively decided which Roosevelt he will emulate, although I believe he leans toward the 1934-1936 Roosevelt. Which is what we need. Admittedly a bold anti-right, anti-corporate course of action won’t be easy. The opponents are many and powerful. Resist they will. Thus to level and tilt the playing field in a progressive/radical direction, the president has to be joined, prodded, and where necessary differed with by the labor-led coalition that elected him. So far it hasn’t carried its share of the load; it is not even strong and united enough to enact even the program that the president outlined last night – let alone win more fundamental reforms. Too many of us have been content to watch, offer opinions, criticize, express our frustrations, and feel disappointed in the president. But aren’t we part of the problem too, indeed a big part? An era of reform – and especially radical reforms – combines popular, sustained, and united action from below with new political openings from above. Both are necessary. Last night the president got the ball rolling, but he didn’t roll it far enough or always in the right direction. So now it’s our turn to get a lot more players involved, roll the ball further and roll in the direction of economic security, equality, democracy and peace. The only real difference between Democrats and communists is that communists are at least honest about the fact that they are communists. I recall posting a story in which the former communist newspaper Pravda – having come through the collapse of their country caused BY communism – wrote a piece blasting Obama’s America for heading down the same disastrous path. That was in 2009. And here we are, two years later, and U.S. borrowing just surpassed 100% of our entire GDP, and manufacturers are doing anything BUT manufacture, which is balanced by the fact that the services industry is similarly tanking, layoffs are at a 16-month high, housing is now WORSE THAN the Great Depression and consumers are terrified to buy anything. And we’re pretty much screwed with Obama as our tyrant emperor. And of course the writers of Pravda saw it coming because they’d had to live through the time when their communists were sending their country to hell. YES WE CAN (implode just like the U.S.S.R.)!! !